The Roto display head by Tech Lighting features a simple design that highlights its defined geometric sleek body shape. 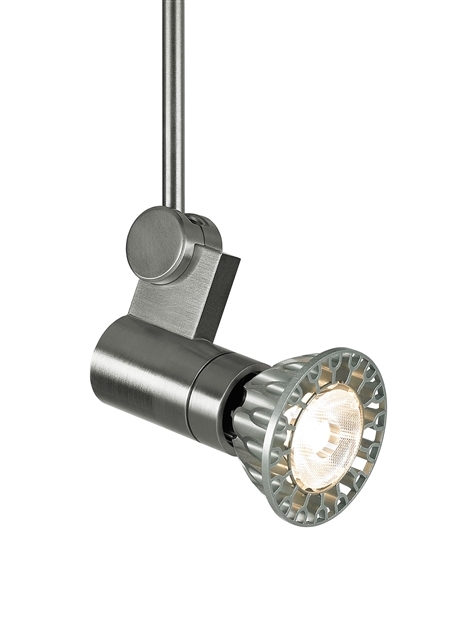 The Roto has been specifically designed to employ an MR16 lamp which celebrates the unique design of this high-performance lamp. Light goes where you need it the most with its 360° rotating head and 260° pivot. The Roto is available in a contemporary satin nickel finish and features four distinct stem lengths allowing for optimal length customization. Enhance the Roto by combining it with the complementary Monopoint or Monorail systems available by Tech Lighting. This low-voltage display head is ideal for commercial lighting applications such as retail stores, libraries and galleries. Compatible with standard MR16 lamps, 50 watt max. (Lamp Not Included). Currently not compatible with the SORAA MR16 LED lamp. Accessory sold separately. Specifically designed to employ MR16 LED lamp. Length -- Choose -- 3" 6" 12" 18"